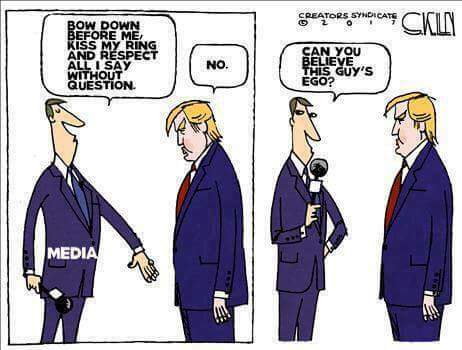 I still dont get why all the MSM spokes persons get worked up when Trump talks about the lying media. Even FOX gets their underwear in a knot when he isnt even talking about them…usually. They act like calling a “journalist’s” integrity into question is an unthinkable injury to a sacred thing. If a large group of nurses were killing or harming their patients for a purpose of their own, we other nurses would stand and point the spot light at them ourselves. We would not want to defend or be associated w/ them. We would be more concerned for patients and the image of nursing in general. I hear you. Journalism is in such a sorry state, that most don’t recognize how far they’ve fallen, or they don’t care. They know but dont see it that way. Journalism WAS a liberal arts type degree and took pride in that they (unlike us poor uneducated science degree types) were thinkers and knew how to carry on a debate to increase the body of knowledge. This started changing in the 50’s and 60’s but went down the proverbial genuine knowledge and debate toilet in the 70’s. I ran into a young girl stating she wants to study journalism. For the life of me, I could be neither happy nor impressed. Another young one paying a vast sum to b/c another person incapable of individual thought.